School districts across the nation expect their employees to connect with youth both in and out of the classroom. Al Overhaug exemplifies this type of employee and has gone beyond those expectations. Al graduated from Northern Illinois University. In the fall of 1970, he accepted his first teaching job in Tomahawk to teach social studies as well as coach football and basketball. Most of his coaching was at the junior high level but he also coached at the high school level. Al was extremely active coaching multiple sports during the course of the school year, the summer months and even after his retirement. Al has made a lasting impact on sports in Tomahawk. He is responsible for starting both the junior high school basketball and track programs as the Black & Blue junior high football program that existed for many years in Tomahawk. He would do whatever was needed to develop a program. Facing the start-up of a junior high basketball without equipment, he appropriated four basketballs from the high school program so that his players could practice. While a member of the Tomahawk Jaycees, Al along with Gordy Erickson started the Jaycees Little Olympics program. Al had a way of getting the most out of his players. They knew what Coach Overhaug expected of them and they did not want to disappoint him in their performance. Al encouraged student athletes to try as many sports as possible while in junior high. He encouraged commitment to their sports so they could meet with success. During his tenure at Tomahawk, Al coached two years of high school football, 12 years of high school baseball, 36 years of junior high football, 20 years of junior high basketball, 22 years of junior high wrestling, and 32 years of junior high track. Since retiring, Al has been active in his church and has volunteered with a number of service organizations including Tomahawk Food Pantry, Neighbors in Need, Holden Village, The Fuller Center for Housing, Disaster Rebuilding in Mississippi, Habitat for Humanity in El Salvador and Guatemala, the Christian Appalachian Project and Education and More(Guatemala) of which he serves on the Board of Directors. 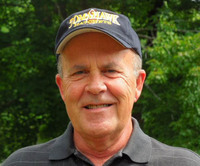 Presently, Al and his wife Deb are retired from teaching and living in the Tomahawk area. He is the father of four children, Amy, Beth, Sara and Derik.